Back in 2000, M. Night Shyamalan's Unbreakable was released to pretty decent reviews. I remember sitting in the theatre and not understanding where this film was headed AT ALL. In fact, I was pretty sure I didn't like the film. Then, when the film's twist ending came into play - I was singing another tune. This film had now become AMAZING. That's what we have come to expect from Shyamalan (Split) - surprise endings, never knowing how the film will end. This year's "Glass" was no different but, this time, I'm not so sure that was a good thing. if you haven't seen the film already, you can now judge for yourself with the release of Glass on 4K UHD combo pack. Glass picks up after the end of 2018's Split and the aforementioned "Unbreakable". The film begins with Kevin (James McAvoy; X-Men: Dark Phoenix) holding four teenage girls in a warehouse. As it happens, David (Bruce Willis; Die Hard) sees Kevin out and about and after brushing up against him, gets a vision of the girls and where they are. David decides he must take action, and winds up freeing the girls and fighting with Kevin. However, the duo gets exposed during their fight when a team of officers carts them off to a mental health facility. This facility already has a famous resident though - Elijah Price/Mr. Glass (Samuel L. Jackson; Avengers: End Game). All three are brought into a therapy session with Dr. Ellie Staple (Sarah Paulson; American Horror Story), who is trying to convince them that they are all delusional and not "superhumans" as they (and others) believe. Staple's theory is that all three have a distinct type of brain damage and that this is what allows the three men to believe they have any kind of superpowers. She seems to make an impression on David and Kevin but Elijah remains unresponsive and catatonic. Or, so we think. However, being the superior intellectual being that he is, he is merely plotting away and waiting for the exact time to begin his revenge. In reality, we see that the three men are indeed special so much so that they have their own enemies out to get them. But who will have the last laugh in the end? It may not be who you think. After seeing the big reveal at the end of "Split" I felt that the Shyamalan of old was back and something I never thought would happen occurred. Without out us even knowing, he created his own "superhero-verse" that just unfolded before our eyes. It wasn't just me that was amazed, but most of the moviegoing world felt that way as well. With the high expectations, Glass was bound to not please everyone. However, it didn't just do that but left most people with a question mark and a longing for more after the film ended. Acts 1 and 2 were amazing, and the addition of Paulson only made the dramatization more realistic. However, the third act felt extremely rushed and did not provide the proper closure that people had wanted in the series. Glass is presented in 2160p with its original aspect ratio of 2.39:1. The HDR10 encoding truly makes the video quality pop. Skin tones are spot on, and field depth and sharpness makes you feel as if you are in Philadelphia alongside all the characters. Glass features a Dolby Atmos soundtrack that will simply amaze you. Every little detail is heard. To coin an old phrase, you can even hear a pin drop. Yes, it is that good. The combo pack includes the following special features aside from a Movies Anywhere Digital HD copy of the film. Alternate Opening: With optional M. Night Shyamalan introduction. Deleted Scenes: David Alone at Bar, Patricia Talks to Cheerleaders, David Encounters Pierce, Casey in Art Class, Dr. Staple Explains Machine, Mrs. Price in Waiting Room, Mrs. Price Talks to Elijah, Dr. Staple Drinks Tea, Pierce Checks Elijah's Room, Mrs. Price Tells Elijah About Surgery, David Submits to Dr. Staple, and Patients Worship The Beast. The Collection of Main Characters: A look at the main characters of the film including David Dunn, Elijah Price, and Kevin Wendell Crumb. A Conversation with James McAvoy and M. Night Shyamalan: The duo discusses the film and the characters in it. Bringing the Team Back Together: A behind the scenes look at the Shyamalan film set. David Dunn vs. The Beast: A look at the making of some of the action scenes. Glass Decoded: Shyamalan talks about some of the props in the film and the film's overall color tones. Breaking Glass: The Stunts: A look at some of the stunts in the film. Connecting the Glass Universe: A look at how all the films are connected. M. Night Shyamalan: Behind the Lens: The cast and crew discuss working with Shyamalan. The Sound of Glass: A discussion with Composer West Dylan Thordson. Enhancing the Spectacle: A look at some of the film's digital effects. Raven Hill Memorial: A look at filming on location at the abandoned mental hospital in Allentown, Pennsylvania. Night Vision: A look at the process of Shyamalan's making of a story and bringing it to life in film. Overall, I found this film to be a bit lacking. The ending, while not what I expected, was hardly a twist that was mind-blowing or entertaining. It fell extremely flat for me and didn't have the same surprise I have come to expect from Shyamalan. The film was also a bit too long and, despite having these amazing superhuman characters, really didn't pack much of a punch in the way of fight scenes (or action scenes for that matter). The plot-line is such a good concept but just isn't executed well, which is a shame when you have this much acting talent at your disposal. 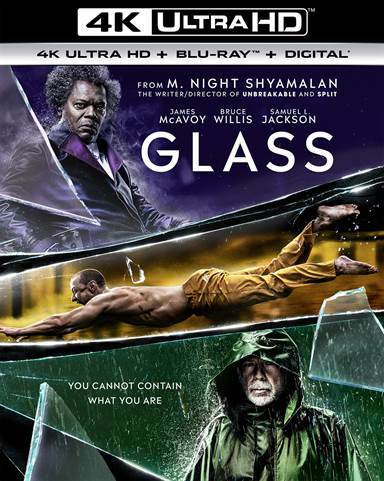 Download Glass from the iTunes Store in Digial HD. For more information about Glass visit the FlickDirect Movie Database.